The Books for Walls Project: How Green Is Your iPad? How Green Is Your iPad? With all the talk of iPads and Kindles these days we are trying to remain informed about pros and cons. 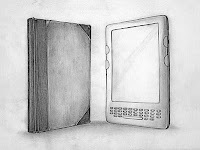 From the Opinion pages of the New York Times the e-readers go head to head with books environmentally. "So, how many volumes do you need to read on your e-reader to break even? With respect to fossil fuels, water use and mineral consumption, the impact of one e-reader payback equals roughly 40 to 50 books. When it comes to global warming, though, it’s 100 books; with human health consequences, it’s somewhere in between. All in all, the most ecologically virtuous way to read a book starts by walking to your local library." Give the whole article a read, very short and well worth it. Click here to read it on the New York Times Website. come by tomorrow for a new Challenge --our contact with Antarctica has given us great inspiration! Here are some of the ways that I let my love of books (and the collecting thereof) balance the 'green' factor... I DO love the local libraries... working in Traverse City, I enjoy perusing the music, old movies, and new fiction at the http://www.tadl.org/. Living in Frankfort for the past couple of years, I've enjoyed a quick jaunt along Betsie Bay to the http://www.benzieshoreslibrary.org/. The librarian is sweet as pie! She holds books for me and reminds me when the Spanish CD's (for my commute) are back in. Other than library book borrowing, I like to trade stacks of books back & forth with friends. Just yesterday, I got home from work to find a bag filled with six books I'd never read, waiting by my backdoor. As a fan of book collecting, and gifting books, I don't know if I'll EVER be able to let go of the habit, but after reading this, I will reconsider gifting gently-used books, etc. (I just don't ever want publishing or books to go away, so as that sweet little quote on the site stated (in so many words) the other day... 'when I save a few bucks, I buy books! '(and a CD and/or record here & there as well!) I don't plan to invest in a Kindle EVER.